Have you ever wondered why washing your face with a bar of soap is not a good idea or do you have overly sensitive or flaky skin? Or do some products make your skin goes absolutely crazy. 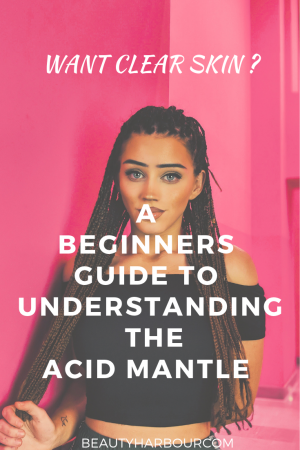 It’s all about your acid mantle, never heard of this right? Neither had I until I went down the skin care rabbit hole and discovered just how important understanding the acid mantle is to maintaining healthy skin. Here, I talk about pH balance, how the acid mantle protects your skin, why certain products are more effective and the best products to restore your skins acid balance if it is out of whack. First to understand the acid mantle we need to talk about PH. PH is a method of measuring the acidity or alkalinity of any substance and ranges from 0 the highest level of acidity to 14 the highest level of alkalinity and 7 which is neutral. Different body parts have different PH levels from 0-14 and maintaining their specific PH is crucial to health. Most substances fall on one side of the spectrum as either acidic or alkaline, except water which is neutral with a PH of 7. It is a thin protective slightly acidic water-lipid (oil) film found on the surface of the skin which acts as a barrier between you and the outside elements. It also protects the skin from acne-causing bacteria and helps it to maintain its moisture balance. When your acid mantle is fully functional and intact your skin will look and feel great. The acid mantle is made of a mixture of dead skin cells, oils (sebum) and other skin secretions and sweat. This helps keep one’s skin at an optimal, slightly acidic PH between 4.5- 6.2 which is a protective barrier and the body’s defence. 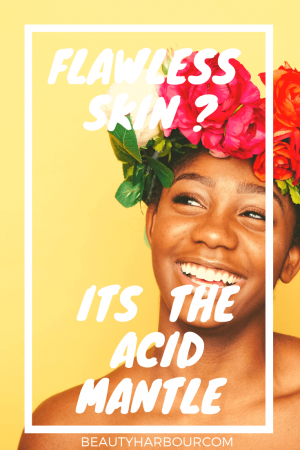 The acid mantle can be disturbed by environmental factors, alkaline cleaners and over exfoliation all of which raise the skin’s pH reducing its natural defences. Maintaining the pH of skin is crucial for its health, and a pH above 7 creates an alkaline environment which is bad for skin. Healthy skin has a pH below of 7 and a pH of 5.5 is optimum for the skin’s health. This is why you don’t want the squeaky clean feeling after you wash your face ,it means you have stripped off your acid mantle. Good face cleansers are specially formulated to maintain the acid mantle. Once the acid mantle is disturbed, skin is vulnerable to bacteria and foreign elements which thrive in alkaline conditions. Chronic disruption of the acid mantle affects the skin barrier function which leads to dry skin, inflammation and atopic skin diseases. If bacteria penetrates your skin they may enter the bloodstream leading to inflammation, allergies and breakouts. Use cleansers with an acidic pH to avoid more trauma to the acid mantle. I hope this was as illuminating for you as it was for me. Let me know what you think in the comments section. Subscribe and follow me on Instagram for more skin and beauty tidbits.